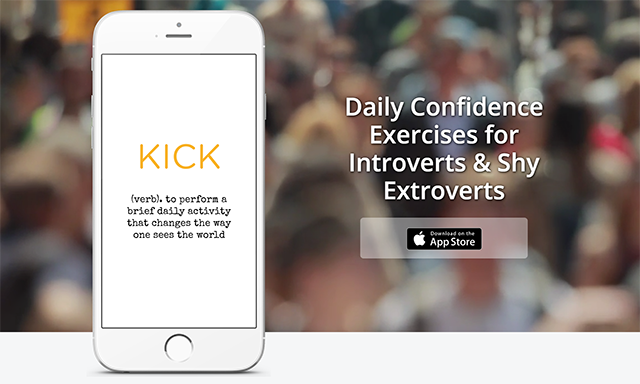 Kick offers daily confidence exercises for introverts and shy extroverts. There are many apps out there that motivate users to do good things for the world, to try new things, or to overcome fears and anxieties. None of those apps are as simple, or as motivational, as Kick. 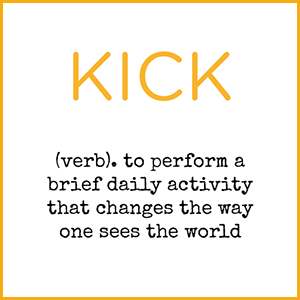 Kick is updated on a daily basis with a “Kick of the Day,” or a task aimed to get users out of their comfort zones and doing something positive. 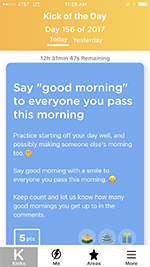 On the date this blog post was published, for instance, the “Kick of the Day” was “Say ‘good morning’ to everyone you pass this morning.” There’s a brief explanation of what the task entails, and that’s it. Simple, yet effective and motivational. You can also choose which areas of your life you need to work on, and Kick will specify tasks for you. Beneath each Kick of the Day, users leave feedback about how well they performed the task, how the task made them feel, etc. 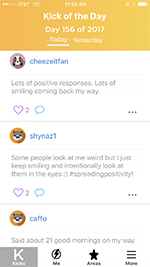 There’s an active community using the app, which offers even more inspiration and motivation to complete each task. There’s a ton of gamification built in to Kick. Each “Kick” is worth points, which improve your profile’s overall score. You can also “Challenge a friend to Kick it” via the app. Not all of the challenges on Kick are groundbreaking, and some of them aren’t even worth pursuing, but it’s still nice to get a daily bit of inspiration. Kick encourages users to turn on push notifications, but you can always just check the app each day you feel like it instead.